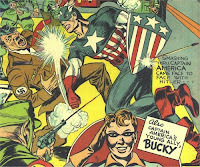 It's been revealed in a newsblog on Comic Book Movie's website that there will indeed be Nazis in the movie. You can read the report here. Schmidt (the Red Skull) runs an organization called Hydra, which starts as a part of the Third Reich power structure, and so therefore they are Nazis. I can sort of see why people are like, they’re not seeing a bunch of guys in SS uniforms or Gestapo uniforms running around in the Super Bowl trailer— that’s because many of the Nazis in First Avenger wear Hydra uniforms. It is not some kind of rewriting of world history. There are Nazis in the movie, I’ve read the script. It is not trying to pretend that the Nazis didn’t exist, or that World War II didn’t happen the way we all know it from history. OK, so they are there. We just didn't know it because they are wearing different uniforms. Here's another part of my concern with this. I think Marvel/Paramount chose the wrong way to handle to PR for this movie. The THOR movie will be out in May of this year. We started seeing things for the movie at San Diego Comic Con in July of LAST YEAR. So...10 months of PR for Thor, and essentially 5 months for Captain America, because we really haven't seen anything up until just before the Super Bowl which was the first of February. We'll see how this works. Ergo...Captain America has to fight Nazis in the movie! There was a concern felt by a lot of fans (and I'll admit it too) that there was an attempt to PC the movie. Hell, they're changing the title to The Avenger so it can be shown in Russia, Korea, and the Ukraine. So is it too far of a leap to think that they think Nazis might be a sore subject for some people? I don't think so. I'm glad we got this cleared up.